Overall it was a tremendous atmosphere that will change the way you practice cosmetic dentistry! It’s great to have the support network and mentors. Seeing excellent dentistry by fantastic dentists made me even more determined to achieve my goal of AACD accreditation. Inspiring, unparalleled, amazing, eye opening, informative. Those are some of the words first-time attendees used to describe their experiences at the 34th Annual Scientific Session of the American Academy of Cosmetic Dentistry (AACD) in April 2018. The AACD is a professional dental organization dedicated to advancing excellence in the art and science of comprehensive cosmetic dentistry.s, and reliable adhesive properties to teeth and all restorative materials. 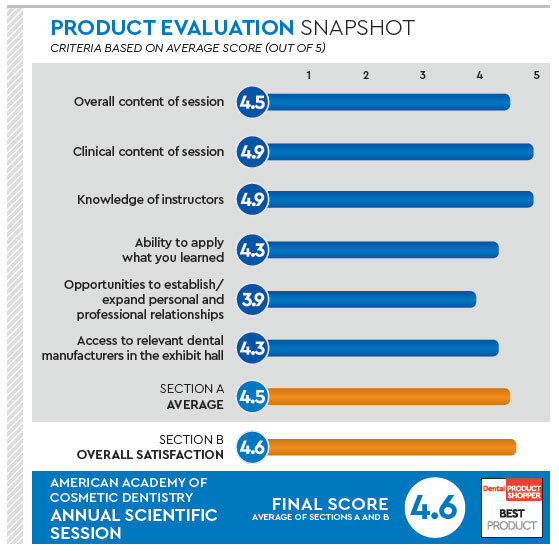 In this evaluation, DPS shares comments from several cosmetic-minded dentists who attended their first AACD Annual Scientific Session. Calling it a very informative and pleasant experience, a California dentist said the AACD meeting was “a great way to expand your knowledge and learn different techniques in cosmetic dentistry.” Praising the session for its hands-on workshops, Dr. Rijesh Krishnan traveled from India for the event. Though he had not taken advantage of the early bird registration and found some courses full, he concluded that the session overall was a “real eye opener” and that it helped him on his way to the Accreditation process. Lamiaa El Ghandour, DMD, came away impressed with the community that gathered for the event, calling it “a group of people seeking excellence and ready to share their knowledge.” When asked if there was anything that could be improved upon at the event, she suggested adding more room in some of the workshops, and another dentist proposed that more courses be offered for hygienists and staff. Dr. Bargiel said he saw some amazing dentistry performed and that it was explained in a great way. Dr. El Ghandour described the AACD program as “the only scientific session that you still learn a lot in and are able to apply what you learned.” She praised the hands-on workshops and said she was able to use the products and techniques when she returned to her practice. Because of the AACD meeting, Dr. Sarah Carlson said she now has more direction for her practice. “I signed up for a direct composite course sponsored by Cosmedent, and I have used those techniques in practice,“ she shared. One of the goals of the AACD session is to unite dental professionals who share a common interest in excelling in cosmetic dentistry. “It was a good chance to meet colleagues who also share the passion for cosmetic dentistry,” noted Dr. Bargiel. Dr. Rijesh called it a “great knowledge-sharing platform,” and Dr. Carlson said she enjoyed meeting many of the long-established and well-published doctors that she had previously known only by reputation.